Hampshire and Thames Valley Police now have technology to help work out when drivers are using mobiles behind the wheel. High-tech signs can detect moving vehicles with phones being used, then flash up a warning. Working with technology Company Westcotec, the Joint Operations Unit will be using the new piece of technology to detect how many cars on a particular stretch of road are using their phones without hands free. It will help officers in the Thames Valley and Hampshire to target particular hotspots for enforcement. The technology can detect when Bluetooth is being used but cannot detect if a passenger is using the phone, but the sign will still be activated reminding motorists of the distraction of a mobile phone whilst driving. They are officially announcing it ahead of a week of enforcement and education activity starting on Monday 15 April through to Sunday 21 April which is part of the National Police Chief's Council campaign. The detector will be located on the A34 in Oxfordshire but will be posted at different locations throughout Hampshire and the Thames Valley in order to assist officers in enforcing the law around using mobile phones whilst driving. Additionally officers will be stopping motorists caught using their mobile phone at locations throughout Hampshire and the Thames Valley. This will include officers making use of a bus provided by Stagecoach to stop those using mobile devices while behind the wheel. Those people caught using a mobile phone whilst driving can get an automatic fixed penalty notice. As of March 1, 2017, you'll get six penalty points on your licence and a fine of £200. Your case could also go to court and you could be disqualified from driving or riding and get a maximum fine of £1,000. Drivers of buses or goods vehicles could get a maximum fine of £2,500. The campaign is being supported by Kate Goldsmith who lost her daughter Aimee Goldsmith, aged 11, following a road traffic collision on 10 August 2016. A lorry driver had been using his mobile phone to change music whilst driving. He ploughed into stationary traffic crushing a number of cars and killing Aimee, her stepbrothers Josh Houghton, aged 11, Ethan Houghton, aged 13, and the brothers mum Tracey Houghton, aged 45. "I am supporting this campaign and welcome any technology which can assist in educating people and stop them from using their mobile phones whilst driving. "Most mothers look forward to planning their daughter's weddings. I had to plan Aimee's funeral. "My son Jake was travelling in the car behind the one that Aimee was travelling in, thankfully he was uninjured, but he literally saw the moment that killed his sister. "Please take a minute to just think about that. Seeing your sister, brother, daughter, son or any person you love being killed. "This was down to someone being distracted by their phone whilst driving a lethal weapon. My daughter's death was completely avoidable. "Please don't use your mobile phone whilst driving it's not worth the risk." "Research shows us that you are four times more likely to crash if you are using a mobile phone whilst driving, reaction times are around 50% slower than a driver not using a mobile phone. "It is also apparent that you are twice as likely to be involved in a fatal collision when texting compared with drink driving. "In the Thames Valley since 2014 there have been 83 people killed or seriously injured as a result of drivers using their mobile phones and 40 have been killed or seriously injured Hampshire. "It is vital that people take notice and stop using their mobile phones whilst driving. 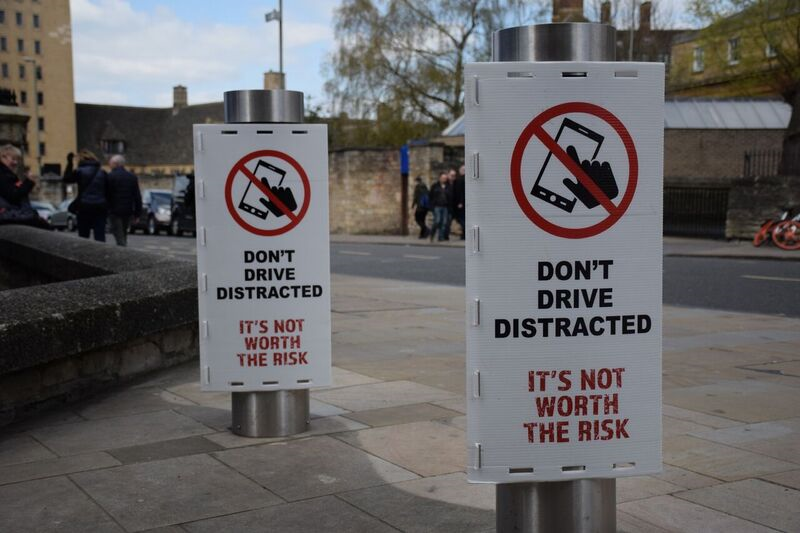 "The Joint Operations Unit will continue to educate people of the dangers of using a mobile phone whilst driving through our "It's Not Worth The Risk" campaign and reduce the devastating impact it can have on people's lives. "We will be utilising the new technology from Westcotec to help inform our enforcement activity to find hotspots and also further educate motorists. "My advice would be to turn off your phone whilst driving, put it out of reach, out of view so that more innocent people don't lose their lives. Remember it's not worth the risk." "Our system is designed to provide intelligence to police officers so that they can carry out enforcement activity in order to reduce the amount of people who are using mobile phones illegally on our roads. "Our technology provides a visual sign to motorists who are using a mobile phone whilst driving without Bluetooth. "We are pleased to be working with the Joint Operations Unit for Thames Valley and Hampshire Police to reduce the devastating impact of people driving whilst using a mobile phone. "We will continue to develop new technologies so that we can help reduce people being injured and losing loved ones through the needless use of mobile phones whilst driving."